A new report reveals how Monsanto’s pesticides are causing birth defects and cancer in Argentina. 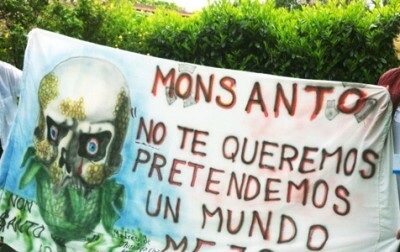 What’s more, anti-Monsanto protests have sparked near farming communities due to massive pesticide-induced illness. What this community and others with similar symptoms have in common is that they are all near large fields sprayed with glyphosate by planes overhead. Glyphosate is Monsanto’s herbicide, one that’s been proven to cause birth defects and numerous poor health outcomes. Studies from Argentina, as well as numerous other countries including the U.S., came to these conclusions. In Sofia’s community, the mothers joined forces, calling themselves the Mothers of Ituzaingo. They took a survey, gathered from members of their community, and presented it to their government demanding an investigation. The government agreed. The concerns of the Mothers of Ituzaingo aren’t unique to that community—these same concerns are spreading across Argentina, where cancer rates in such farming locations are sometimes two to four times higher than the national average. In one village, Chaco, birth defects reportedly quadrupled in the decade following the introduction of biotechnology including glyphosate. This growing opposition to Monsanto and its methods has not gone unnoticed by the company or those who support it. Farmers who align with the GMO-giant are openly critical of the protests. Gatica says one farmer came to her home and threatened her with a shotgun. But she and her partners do not plan on relenting. Last year, a soy farmer in Argentina was found guilty of spraying herbicides near residential areas, marking a victory for community health and acknowledgement by the courts that these chemicals could have seriously profound effects. But they still have a long way to go. Gatica says they want the government to control the activities of soy farmers more closely. She wants all GM-soy and related chemicals (including glyphosate) banned and wants the companies who provide them to get out of Argentina. Because the companies and soy farmers have no intention of leaving and because the Argentinian government sees soy as necessary for food security, the fight is definitely just heating up. I SURE HOPE THAT THE GOVERNMENT OF ARGENTINA (UNLIKE THE U.S. GOVERNMENT) LISTENS TO ITS CITIZENS, AND GETS MONSANTO AND THE OTHER DEMONIC COMPANIES PRODUCING AND FORCING THESE CHEMICALS ON THE CITIZENS OF ARGENTINA OUT OF THE COUNTRY. CITIZENS OF EVERY COUNTRY HAVE “UNKNOWINGLY” BEEN FORCED TO CONSUME THESE CHEMICALS.